The auditory stimulation treatments are called "intensives." The full program spans over a four to five months period. Working with specially designed Tomatis® devices, you listen to a listening program that is set up for you only. 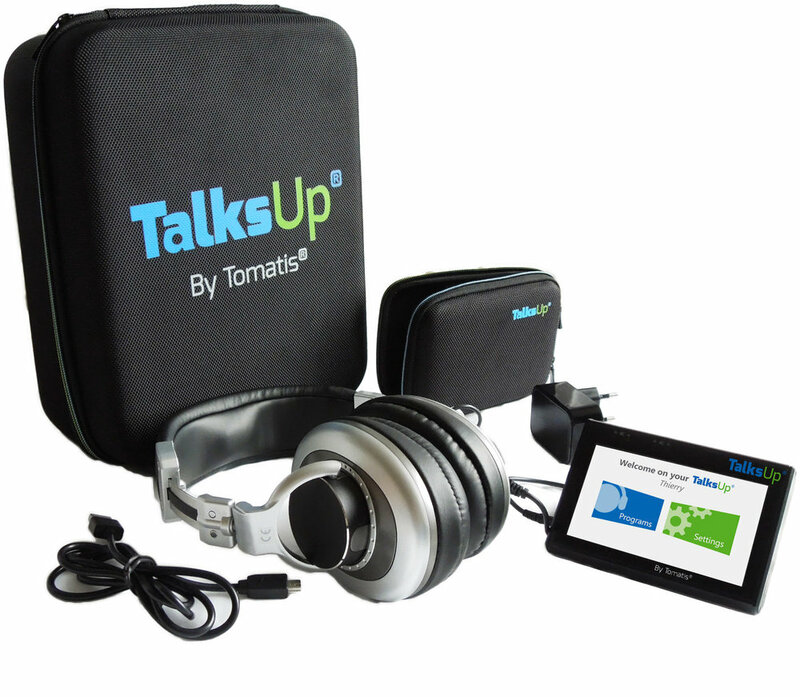 You can do the entire program comfortably at home using the portable TalksUp device. As a trained level 4 consultant with several years of experience, I will conduct an initial interview (~ 1 hour) in my office in Brookside, Kansas City. In some cases, when the distance does not allow it, it is possible to conduct an interview through Skype. During this interview, we will discuss what you would like to work on and set up goals. I will then evaluate your listening with a test called the Listening Test (TLTS). In this test I do not test what you hear, but rather how you listen. Eventually, this test will serve to identify your listening potential and possible dysfunction. Based on the diagnosis, I can establish a personalized intervention program, adapted to your needs and specifically targeting your goals. The listening test is an important tool in the Tomatis® method, but it remains optional and complimentary with the program. The listening test is approximately 45 minutes and non painful. The auditory stimulation treatments are called "intensives." The full program spans over a four to five months period. Working with specially designed Tomatis® devices, you listen to a listening program that is set up for you only. You can do the entire program comfortably at home using the portable TalksUp device. in most cases, the program contains a minimum of three intensives listening sessions of 10-15 days each combined with rest phases, which ensure that individual progress is lasting. The duration and number of sessions will depend on the issue in question. Generally, one listens to 2 hours every day for an overall program of 60 to 90 hours. Forbrain® can be used during breaks. When possible, active sessions (speaking exercises) are usually added after one or two intensives. These active sessions contain reading, repetition or expression exercises during which your voice is instantaneously modified and transmitted according to the specific parameters of the Tomatis® effect. The voice is corrected in real time and, as a result, unconsciously modulates it. After each listening sessions, a listening test is recommended to evaluate the progress made and adjust the next listening programs. The mother's voice: In specific cases, the mother's voice (filtered at 8000 Hz) is also used during the therapy. After the last listening session, a final listening test is conducted. This assessment serves to gauge progress and determine if other sessions are recommended. The program is mostly constituted of modified music by Mozart along Gregorian chants and occasional Waltzes. Why Mozart? Because Mozart's music is extremely rich in harmonics needed for the Tomatis effect. Mozart 's music is also appreciated worldwide. BOCCARD STUDIO is duly licensed by TOMATIS DEVELOPPEMENT S.A. level 4, which is the owner of TOMATIS, TOMATIS + LOGO, SOLISTEN, TALKSUP Trademarks new.tomatis.com or www.tomatis.com.